What's More Important -- Business or the Law? Do you recall the Monster.com television spots from a few years back, with kids expressing their hopes and dreams? With lines like "I want to claw my way up to middle management" and "I want to be paid less for doing the same job" Monster.com captured the quiet desperation of the American workforce. 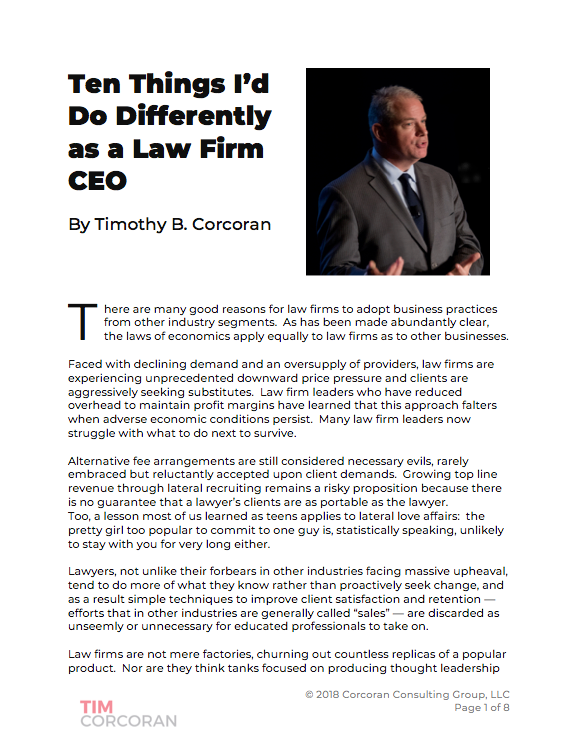 This blog focuses on the corporate and large law firm legal marketplace where we carry out our own version of this melodrama every day. Readers of this blog will quickly note that I believe the purpose of a business is to produce a compelling product at a sustainable profit, and the legal function -- encompassing the in-house law department and its outside providers -- serve to support that purpose. We who spend all day every day in this legal marketplace at times lose focus on this objective. How many actors have we seen who love the stage but appear to struggle with life in the public eye? How many professional athletes excel on the playing field but fail spectacularly managing their finances? This ancillary baggage is not what they signed up for, but it's a necessary component of the path they've chosen. In the same way, entrepreneuers who wish to build impressive buildings, or develop fuel-efficient vehicles, or design innovative tools for web commerce, or invest funds for charities, or who are engaged in any other business, rarely understand the extent to which they must deal with legal issues. It's not an indictment of the importance of the legal function for me to suggest that we should strive to minimize the extent to which legal issues distract businesses from their main purpose. After all, most businesses provide coffee in the break room yet there is far less hand-wringing in the board room over the plight of coffee vendors, or how technology is disrupting the traditional means of production, or whether the coffee producer's billing models appropriately reflect the value of the product, or whether globalization should displace the role of traditional suppliers, and so on. It would be unfair to equate law with coffee, of course. But it's also unfair to saddle business with the burden of sustaining an inefficient legal marketplace. Occasionally I'll get a note from a reader thanking me for some insight, but asking for more or better examples. So lest I ever sound like the armchair quarterback who's never played the game, or the Sunday morning talking head who's never been elected to office, I am delighted to provide relevant examples from my own experience to help illustrate a point. Some years ago I worked for a publisher that specialized in printing large reference volumes for businesses to find other business services. These volumes included both free content and paid advertising (think of the white and yellow pages). We invested heavily in technology to modernize our production processes, but occasionally mistakes happen. In one notable example, after shipping we discovered an error that resulted in a paid advertiser's contact information appearing at the end of a multi-column ad rather than at the beginning. It appeared as if the robust ad copy referred to the prior advertiser while this advertiser published merely his contact information. The client was not happy. He threatened to sue and demanded that we reprint and ship replacements to all buyers, after retrieving the erroneous copies. Our cost for this would be substantial, far exceeding his ad revenue. We presented the challenge to the CEO and to the General Counsel. The GC laughed it off, dismissing the threat of a lawsuit as minor, reciting all the reasons why such a suit wouldn't prevail, and suggested that at most our obligation was limited to providing a sticker that all recipients could choose to insert in the right place. The CEO took the issue more seriously, realizing that not only would the sticker not appease the client, it would call every advertiser's attention to our error. Furthermore, while the threat of a lawsuit was minimal, the PR impact of our error and our refusal to take ownership superceded the legal concern. He asked us to negotiate a settlement. We ended up reprinting the volume, re-shipping it to all buyers (and asking them to destroy the earlier copy due to "product flaws") and in return we signed the client to a long-term contract with substantially better terms than we had previously been able to negotiate one year at a time. I've managed businesses with a global footprint and regularly hired and managed people overseas, but I know nothing of immigration laws. In one reorganization my management team and I decided to consolidate territories and asked several salespeople to cover multiple countries. This wasn't a problem in the EU, but post 9-11 it posed a problem for our salesperson in Toronto to visit the US regularly. She called us in a panic one day, reporting that she had been detained at the border at Niagara Falls and couldn't proceed or return home until certain paperwork was in order, unless she was willing to accept being officially deported, a designation which would effectively end all future business and pleasure travel to the US. We quickly consulted our regular outside counsel who suggested they could, within 48 hours, present our options for applying for proper Visa paperwork for the salesperson, and present support for their contention that she was being improperly detained under recently changed immigration laws. Best case, the salesperson would be allowed to stay overnight in a local hotel with travel restrictions while expedited Visa paperwork worked its way through the system, likely in a matter of weeks. So we cold-called a small immigration firm in Buffalo, and within an hour a lawyer was en route to the border crossing to negotiate a release. It turns out that her paperwork was not fatally flawed, but indeed there was a need for additional approvals. She was able to return home later that day without the dubious distinction of being deported, and within a few days she had the proper paperwork to successfully cross into the US with no hassle. Despite the above title, it's not a question of whether the legal function is or is not important. The legal function is critically important. The real question we should continue to ask is whether the legal function is supporting the objectives of the business.